The Poorboy's World Biodegradable All Purpose Cleaner (Bio APC) is an all purpose degreaser that can be used all over the interior, exterior and engine bay of a vehicle. This one bottle is a great asset to any detailer who wants to remove dirt, dust, grease, stains, brake dust, road grime from the wheels, tires, dashboard, doors, carpets, trim, engine bay and more. This powerful cleaner is strong enough for doing an engine detail but safe enough for carpet care. It does a fantastic job of breaking up virtually every form of contamination that ranges from heavy soil build ups to stubborn grease. Use it on your dashboard, arm rests, doors, carpets and more for a thorough cleaning. Additionally use it as a wheel cleaner that releases brake dust and other road grime. The unlimited uses of this product makes it a must have for any detailer. You should dilute this cleaner to a 3:1 ratio of water to cleaner for the best value. You can use it full strength on difficult build-ups if needed. 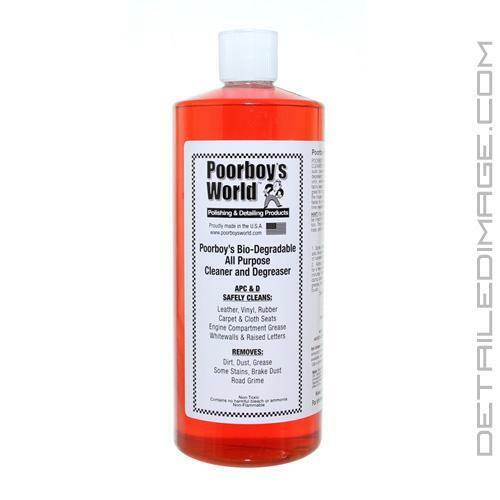 Get the Poorboy's World Bio APC today and give your vehicle the cleaning it needs. POORBOY'S BIO-DEGRADABLE ALL PURPOSE CLEANER & DEGREASER has a safe and unique low suds cleaning formula that is strong enough for degreasing an engine, to gently cleaning: leather, vinyl, whitewalls, carpet, rubber, vinyl tops, tires, fabric seats, door panels and more... APC & D is also great for boats, RV's, motorcycles, planes & around the house too. Our low suds formula also makes it faster to remove from fabric, which will reduce the time needed for drying. HINT: It is always recommended that a small test area be tried for color fastness before complete application. This product is a professional strength concentrate, and may need dilution for some applications. Spray directly on surface to be cleaned. Can also be sprayed or poured onto cloth for cleaning of carpets and fabrics. Allow products to briefly attack dirt and stains for a few moments. For grease stains, wait a few minutes before rinsing or wiping with a clean, damp cloth. Older, stubborn stains, and heavy grease, may require scrubbing with a soft nylon brush. Excellent APC product works as advertised. Excellent product, cleans well, the odor is not bad like others. very economical due that dilution ratio range. Great APC! Cuts through dirt stains on auto interior, carpet mats, and does great on tires as well. Excellent Product!